In 1875, Theodore Woolsey Bacon and David Bacon, two grandsons of Rev. David Bacon, came from the east coast and selected a boulder for the monument to their grandfather. They had it engraved with the following statement: Here the First Church in Tallmadge was gathered in the House of Rev. David Bacon, January 22, 1809. The monument was dedicated on June 2, 1881. The site was later annexed by Akron, and the area surrounding the memorial is called David Bacon Park. Courtesy of Tallmadge History Digital Exhibit, Akron-Summit Co. Public Library. David Bacon was a prominent Congregationalist missionary in early nineteenth-century Ohio. Your religion is very good, but only for white people; it will not do for Indians. When the Great Spirit made white people, he put them on another island, gave them farms, tools to work with, horses, horned cattle, and sheep and hogs for them, that they might get their living in that way, and he taught them to read, and gave them their religion in a book. But when he made Indians he made them wild, and put them on this island in the woods, and gave them the wild game that they may live by hunting. We formerly had a religion very much like yours, but we found it would not do for us, and we have discovered a much better way. In 1804, the Congregationalist Church made Bacon the minister of a church in Hudson, Ohio. He also was to travel throughout the Connecticut Western Reserve, continuing his missionary efforts among both whites and American Indians in the region. The Congregationalist Church also authorized him to establish the town of Tallmadge, Ohio. The church building was to be located in the center of town with all roads radiating outward like the sun's rays. Bacon constructed one of the first cabins in Tallmadge for his family and moved there in July 1807. By February 1808, only two other families, one English and one German, had joined the Bacons. Bacon spent 1808 recruiting more members for the community. He was away from home for extended periods of time. Fearing attack from American Indians in the region, onto whose land Bacon had established Tallmadge, Bacon's wife pulled in the latchstring on the door to make access into the cabin from the outside more difficult and she blockaded the door of the cabin. Bacon had limited success in finding new residents for Tallmadge. By the end of 1808, only twelve families called the town home. Bacon continued to struggle to establish the town. Unfortunately, he had purchased the land for the town on credit. He had hoped to pay off his debts by collecting a land tax. With so few families moving to the community, Bacon could not collect enough in taxes to pay his creditors. He was evicted from his land in 1812. He returned to Connecticut, where he spent the remainder of his life selling religious texts door to door. He died on August 17, 1817. 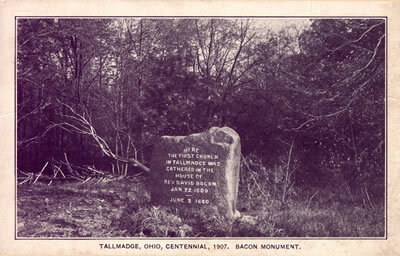 Although Bacon did not live to see Tallmadge grow, the community eventually became the center of the Congregationalist faith in Ohio. Evening News Association. Men of Progress: Embracing Biographical Sketches of Representative Michigan Men. Detroit, MI: Evening News Association, 1900.